Last post we discussed aspects of project success. I wrapped up with the diagram above. You can set people’s expectations by communicating with them. You have many tools to help you communicate effectively, and that's beyond the scope of this discussion. I do want to note one important aspect of expectation management. Whatever you say competes with a lifetime of history and experiences, and of course the nature of your personal relationship with the people you are communicating with. Unfortunately, facts don’t speak for themselves. The facts are competing with people's fears, hopes, misapprehensions, false assumptions and a whole lot of biases. The more your stakeholders trust you the more they’ll listen to what you have to say, and the more their lifetime of accrued experiences will be held at bay. And of course trust comes though empathy, and this is developed by communicating frequently with openness, and by being honest and truthful, even when it’s difficult to bring up hard issues. Perceived experience is of course made up of two components; the perception and the experience. Naturally we will seek to be as “facts and evidence based” as possible when communicating with clients and stakeholders. We need to do this to build trust. The way we present and carry ourselves with clients, they way we model behavior and the way we interact are all important. Primarily we are in the business of delivery, and the experience of the tangible products we produce is core to what we do. So, most importantly you build trust through delivery of product. Secondly there is the nature of perception. 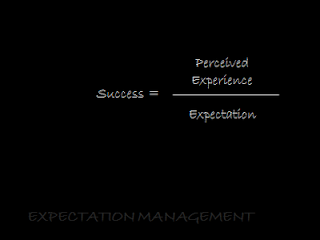 Perception management is like a post facto expectations management exercise. Some people do this well, and others come off as con-men. Don't be in-authentic. Stick to who you are and think about the messages you want to send out. Be coherent in the way you act and speak. Lastly, when things aren't going well, it's an opportunity to test your character. Develop the skill of effective communication to ready yourself for the tough days. For example, bad news is better heard early so that something can be done about it. Practice this technique early and often with minor things, and you'll be ready when the big things go wrong. So, there is some commentary on under-promising and over-delivering. It's a useful piece of knowledge.